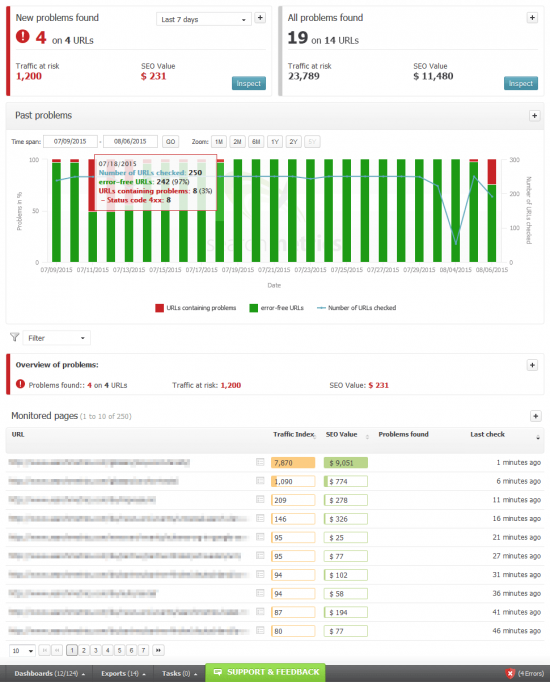 With the brand new Visibility Guard, Searchmetrics has developed an innovative solution for monitoring the on-page performance of your web projects. By regularly crawling your most important pages, Visibility Guard automatically shields you against any losses in traffic and conversions; critical on-page areas are detected and an automatic alert system means you can react before costly losses occur. In most cases, several people are involved in maintaining a website, ranging from administrators to SEOs and content teams. Statistically speaking this increases the probability of error, while monitoring changes, resolving issues and detecting the root cause of errors becomes more difficult. Even routine updates or technical changes can cause parts of pages to be unintentionally set to noindex or redirection errors to crop up without being noticed. Often only after a significant drop in rankings or traffic falls are these errors picked up on. Particularly on money pages this can quickly lead to costly losses. With Visibilty Guard these days are over. 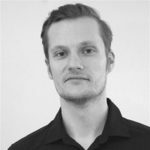 Firstly, let’s talk about two features of the Visibility Guard which will help you save both time, effort, and ultimately revenue. A unique feature of Visibility Guard is its ability to automatically detect the money pages of your domain. You don’t have to identify the individual pages yourself which is a big time saver. In fact, the general definition based on index levels is not always reliable, as these pages could be located on a lower level. Based on this important observation, Visibility Guard has been engineered to detect the most important pages based primarily on URL rankings; as a second data source the SEO value from Content Performance is applied. 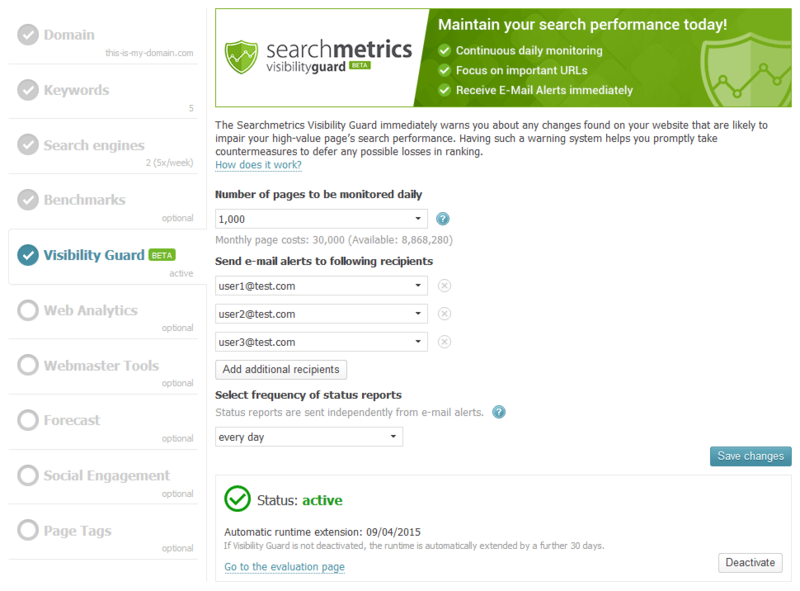 Visibilty Guards uses these combined data to give a page a ranking. This ranking is reviewed every week to make sure only the most important pages are crawled. Individual settings, for instance the volume of pages you want to crawl, can also be applied. By focusing on the most important pages the server load is greatly reduced. Once the crawl volume is set, the corresponding pages are then automatically and fully monitored. This process takes place on a daily basis, and the most important pages are crawled once a day for on-page errors. If a critical on-page error is detected on the money pages, all relevant users and teams (able to be user defined) are immediately alerted via an automated email. Technical problems can be rapidly solved, and negative effects on rankings and turnover can be circumvented. Which errors can Visibility Guard detect? How do I set up Visibility Guard? Setting up your Visibility Guard is very easy. In the project overview, you will see a small icon in the bottom right corner – the shield. If the shield is deactivated then it is grey. After you have activated it, it will turn green, and if on-page errors have been detected then it will turn red. To activate the Visibility Guard, start by going to the Project Wizard. Here, you will find Visibility Guard as a new menu item. Next you can adjust the number of pages to be crawled daily to your individual needs. Visibilty Guard is a subscription service: all settings remain active for 30 days and automatically extend for another 30 days, as long as they were not changed or deactivated. Next you have to add an email contact for the email alert system. The default email address is that of the license holder, but you can add other addresses. The selected and entered e-mail addresses are who the alert mails will be sent to if an error is detected. There are also periodical status emails – you can select daily, every two days or every week – which are sent to the chosen contact person. And hey presto, Visibility Guard is activated. If an alert email is sent, then you’ll receive a link to the URL analysis in the optimization area of the Suite. Here, you will also find the Visibilty Guard overview page. 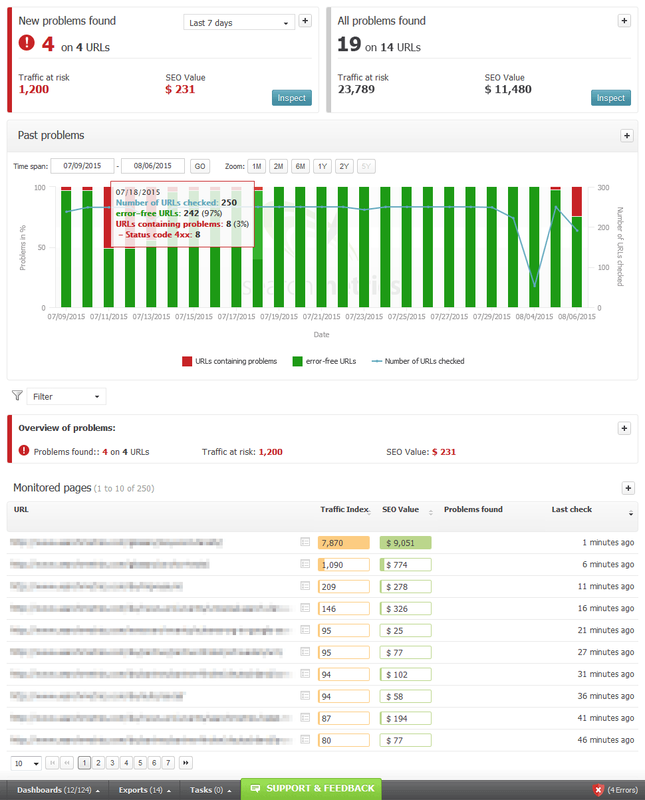 The overview page lets you see at a glance both new and historical problems, including an estimate of the amount of SEO traffic at risk and the associated SEO value. 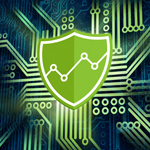 How does Visibility Guard differ to other website monitoring solutions? Unique to the industry is its ability to automatically identify the most important money pages. Set up effort is reduced to a minimum and it makes constant monitoring as resource friendly as possible. If, for instance, my website comprises 100,000 URLs, a daily crawl would be laborious and expensive due to the amount of server load caused. Visibility Guard eases server load by concentrating on the most important pages. Who can access Visibility Guard? Visibilty Guard is available for all Suite Enterprise and Suite Ultimate licenses from 2014 onwards. The billing system is calculated via Page Credits known from Site Structure Optimization. These correspond to the number of pages crawled in a billing month.